At the National Gallery in London with my sister and nephew. I always try to make a visit when I pass through the UK. Today I made a beeline for the Hoogstraten peepshow. My fascination with realism, perspective, the camera, optical instrumentality and everyday interiors continues. The peepshow is a box with a painted interior that you view through one of two peepholes to see a remarkable illusion of a room, with a dog. It involves a quite unrealistic anamorphic distortion that disappears when you look at the room through the peepholes. You might be in there. 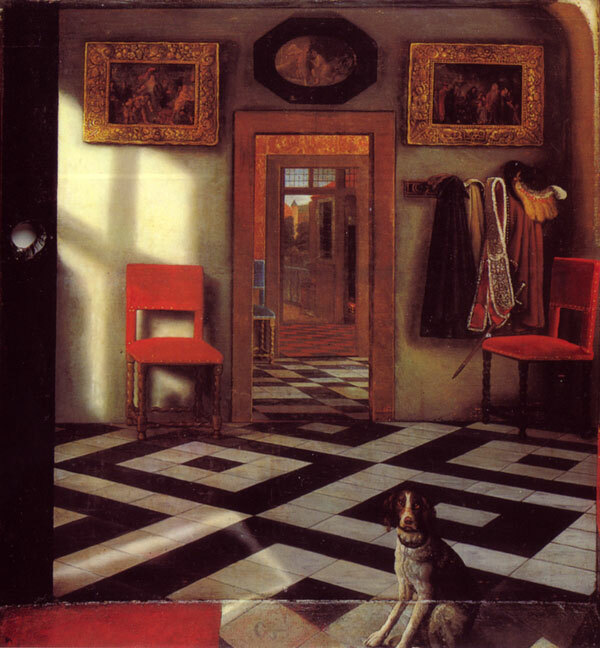 This is a follow-up on my thoughts about Peter Greenaway’s movies [blog link], and Vermeer – Philip Steadman’s fascinating book about Vermeer’s optics. Gwen Lorraine in Stanford Humanites Center has made me a room in a cigar box, a reconstruction of a scene from Hemingway, a scene of crime – to appear in archaeography.